An imposing set, representing the ruins of a classical style building, dwarfs the characters on stage, seemingly making a statement that great scientific discoveries rank alongside architectural monuments in the history of mankind. The grandeur of Christopher Oram’s design characterises Michael Grandage’s production of Anna Ziegler’s play, an account of the race to identify the structure of DNA in the early 1950s. The key figure is Rosalind Franklin, a gifted scientist whose contribution was under-valued in her own time, but who became much more appreciated after her death. The play’s central argument is that Franklin suffered from being a woman in a male-dominated environment, sneered at by her father for entering a man’s profession, demeaned by her colleagues and even barred from eating in the all-male dining room at her place of work. Ziegler presents her case not only by offering a convincing account of Franklin’s brilliance and dedication, but also by diminishing the stature of her male counterparts and Grandage’s production widens this gender gap still further. Stephen Campbell Moore makes Maurice Wilkins, her equal as a scientist at King’s College, seem bumbling and inept and their frequent clashes come across as an uneven match. Joshua Silver plays their research assistant as a self-deprecating twit and the team’s rivals at Cambridge (Edward Bennett and Will Attenborough) look more like buffoons than boffins, even though they are actually the Nobel prize winners Francis Crick and James Watson. Among the males in the play, only the American researcher (Patrick Kennedy), partly mentored by Franklin, is afforded any real respect. This exercising of theatrical licence by writer and director works well in creating entertaining drama, but it does so at the expense of credibility. It is when Ziegler turns her focus away from science and towards the inner Franklin that her play becomes really absorbing and it seems that Grandage decided that the most effective way to suggest Franklin’s suppressed femininity would be to take a glamorous film star and hide her behind a dowdy exterior. If so, there is no Hollywood star more glamorous than Nicole Kidman and it is the perfection of this casting choice that makes the production special. Dressed drably, with an unfashionable hairstyle, Kidman here is closer to theatrical bromide than the viagra of her last London stage appearance and an understated performance, recycling her impeccable Virginia Woolf English accent, makes her an authentic, clinical lady scientist. 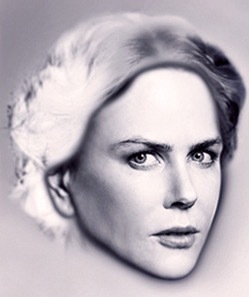 But then, in a revelatory scene, Franklin expresses to herself and the audience what she dreams of, not as a scientist but as a woman, and a radiant smile lights up Kidman’s face, creating an image that will be amongst the most enduring memories from 2015 theatre. Ziegler is showing us how the vagaries of living real lives contrast with the certainties of science, which makes more sense to us non-scientists than everything else in her fascinating play .